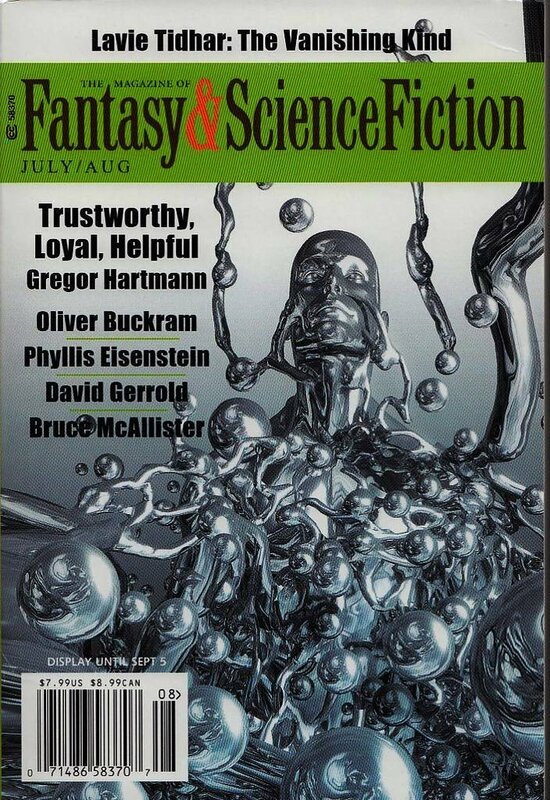 "Vishnu Summer," by David Prill, appeared in the July/August 2016 issue of The Magazine of Fantasy & Science Fiction, published July 5, 2016, by Spilogale Inc. Pro: The descriptions of rural life are evocative. Audrey herself is a very solid character. And she does meet someone a bit like Vishnu, although he doesn't really fix the balance of good and evil, nor does the world come to and end. Con: There's not really a plot here. We don't even find out how the trial ends. Except for the surreal adventure where Audrey falls into the mural and briefly regains her lost arm, there isn't any speculative element. I really enjoyed the characters, the setting, the situation. I think the heart of the story is the appeal of the three-armed man for Audrey, his manipulative use of her -- and yet, some of the time, he's sincere and sympathetic as well. And, the growing dread surrounding Audrey's mother's health, and visions, and murals. The ending really threw me, though. I just literally don't understand what the last two pages are describing, from the moment she wakes up after the corn maze. Audrey understands that her mother "painted Vishnu to warn me, the corn maze to protect me," which sounds like she's come to an epiphany. But what, what are we meant to make of her "pulling her own arm off"? Why is there another motorcade - and which way is it headed? When Audrey follows the dust cloud all the way to town, does that mean she's following the three-armed man, or that she's headed in the opposite direction? I just literally do not understand what is being described. Which is a shame, because I really enjoyed the story up until that point. Maybe I'm just noticing them more, but there seem to be a lot of stories like this lately: well-written, entertaining, but ultimately unsatisfying. In general, or F&SF in particular? I think in general there are, and always have been, a lot of stories like this. It's tough to stick the landing. And a story that starts well and ends poorly, can do better than a story with a strong ending but a weak beginning; nobody gets as far as the end. In general. I will go through the whole year and do some analysis in December, but for now, I only have vague per-magazine impressions. This probably comes of trying to treat each story on its own merits and not let factors like who published it or who wrote it influence me.